Mangoes are so ubiquitous in India, that I feel I really didn't appreciate them when I should have. Now that I no longer get fresh, sweet mangoes off the trees, I crave them so much. I love mangoes. I love them when they're tart and green, and when they've ripened to a soft, creamy yellow. My maternal grandparents used to live in a village an hour or so outside Mangalore, and their garden had a large mango tree. My mum still remembers the taste of those mangoes, as she reminisces about eating them straight off the tree with her brothers and sisters. My sister, cousins and I have other memories. Like good Catholic children, we were woken up at the crack of dawn, and chased to church for the early morning mass. But for us, the mass was secondary to the mischief we would get up to in those early mornings. Because, you see, there was a tall mango tree right by the churchyard near my grandparents' house. And it was a challenge to see how many mangoes we could pick and hide before the neighbouring kids got to the tree. So on the way to church, we would throw stones at the tree and gather all the mangoes, and hide them in various places along the way. On the way back, we would collect them all, and take them home, where we would chow them down before breakfast. Ocasionally, we would find the stashes of other kids, and that was always a particular triumph. Of course, we would get scolded by grandma, who would complain 'look at all these thieving children, they go to mass like little angels, and come back having stolen the mangoes from the church tree'. Those sure were good days, and memories... and even better mangoes. So, you can imagine my delight when I saw a box of fresh mangoes at the Lucky 97, a Chinese supermarket. There were easily over a dozen mangoes in the box, and they were priced fairly reasonably, so Kay and I almost without hesitation picked up a box. We had to wait for roughly a week to make sure the mangoes were perfectly ripe, but when they were, it was totally worth the wait. They were a bright yellow, sweet, with a real tang to them, and even smelt like real mangoes. Peel and cube the mangoes. Puree the mangoes in a blender until very smooth, with a couple tablespoons of the sugar. Chill the heavy cream in the fridge. In a pot, heat the 2 cups of half and half cream and the remaining sugar until just steaming. Do not boil. In a separate bowl, whisk the egg yolks. Little by little, add the hot cream, whisking well after each addition. It is important to do this bit slowly, as you don't want the yolks to curdle. Once all the hot cream has been whisked into the yolks, scrape the mixture back into a pot, and cook on low heat, until the custard thickens and coats the back of a spatula. This will take from 7 - 10 minutes. Don't allow the mixture to boil, as it will curdle the custard. Place the chilled heavy cream in a bowl with a sieve on top. Pour the custard through the sieve and into the cream, stirring gently until well mixed. Now add the mango puree and the salt, and mix it together well. Taste and add a little bit more sugar if you think it needs it. Remember, freezing makes the ice cream mix taste less sweet, so to get the sweetness you want, you may want to make the mix just a little over sweet. Put the ice cream mix in the fridge until it is very cold, overnight if you can. Churn the cold mixture in an ice cream maker, until smooth and creamy. Transfer to a freezer safe container and freeze till firm. awww that looks sooo good! I miss mango! this reminds me and MAKES ME CRAVE mango kulfi! 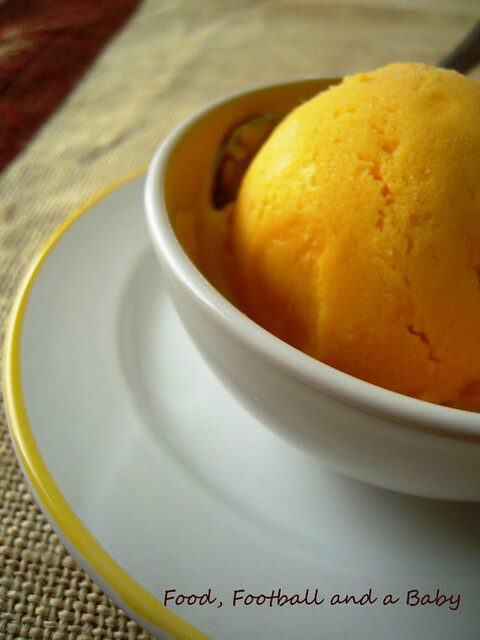 Sublime...I had a mango and ginger ice cream at an Indian resto of late and now I'm inspired. @spontaneous euphoria, I miss mangoes more than any other fruit ever! Whenever I get them fresh, I just lose myself in them. @Peter, thanks :-) I was tempted to add ginger to this batch... but didn't becuase I just wanted a pure mango taste. Good luck with your own. Such fabulous photography Michelle and a wonderful recipe too. I was given an ice cream maker for my birthday last year and have not really used it properly yet. I have a feeling it's about to come out of the cupboard!!! I love mango! You used to pick mangoes off of trees! Incredible. This recipe and these photos scream MAKE ME and I definitely will - when this snow melts - should it ever. Michelle, how much do you think those 3 large mangoes weigh? Thanks Michelle....Bennett Alphonso (Apus)could be 4 to 5 mangoes for 3 cups puree I suppose. oh my...it's a mouth watering treat! I'm hosting a wonderful tea sampler GIVEAWAY! Come check it out when you have time. 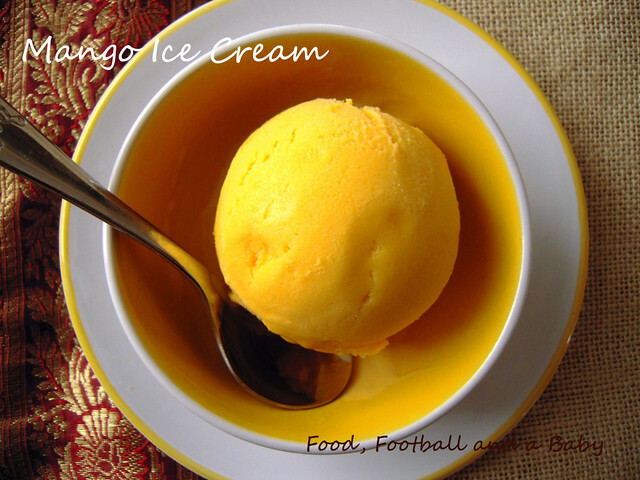 I love mangoes too Michelle and your ice cream looks beautiful. I am going to save the recipe for summer. Wow. This looks so tasty. I LOVE mangoes. I'm not totally sure what it is about them, they are just so good. This sounds and looks so beautiful. I love mangoes too. Thanks for posting. This looks amazing! Now, all I need to do is make mango, lychee, and chai and I will be a happy camper! OF course Dan has his own ideas too! Woah, Lillian, did you get an ice cream maker already? :) This is my signature flavour, I just love it! I have to try out a lychee flavour too. The challenge with lychee will be to get the flavour without the iciness of the fruit.